If you’ve just jumped in, you can read about my Shunt Donation Project (no. 6 on the List) here. Things have been busy so I have fallen a little behind this week in my to-do list. However, today I am back on track, people! Yessir! (Sorry. I can be a bit hyper in the mornings). Yesterday I sent a reminder to the secretary of Mr Mallucci; he told me that I would probably need to do that when I first spoke to him as he has such a hectic schedule coming up. Having spent so many months in the company of neurosurgeons, I do have a good idea of just how hectic they get. It’s not ‘hectic’ by the majority of peoples’ standards; their ‘hectic’ is enough to make one’s brain go into complete meltdown. When I was scouring neurosurgical trainee forums and chat rooms in my research for my F-List: Number Seven, I found it very interesting to see how many threads addressed the topic of how working as a neurosurgeon would impact on one’s personal life. It certainly is a hot subject and a genuine and serious concern of those going into the field as it is so completely full on. I once asked my neurosurgeon how many hours a week he worked on average (he never seems to go home!) and he just laughed. I ventured a guess; ‘eighty?’. He laughed again. Clearly it was more than that, possibly a lot more than that. So this is why I am acutely aware of how I pitch my Shunt Donation Programme idea to neurosurgeons; they don’t exactly have much free time to get on board with everything that’s suggested to them. I have to make it sound like a worthwhile, well-researched project which won’t require masses of work on their part. All I want are interested and eager people; I will do the calling, emailing, travelling, collecting and dropping-off and paperwork. I will do the background work; I just need them to open the doors that I cannot. 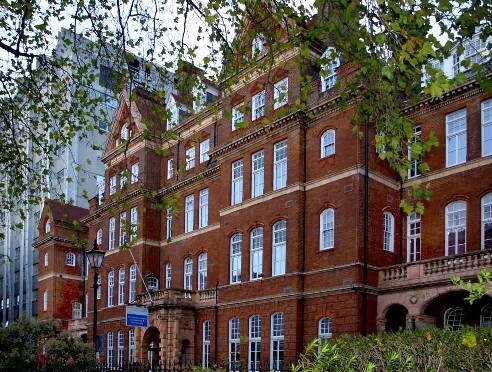 The National Hospital For Neurology & Neurosurgery, Queen Square – the one wot I own. So today – neurosurgeons up and down the country are going to get the same email which prompted Mr Mallucci to take part. I am going to approach two neurosurgeons at my hospital in London. Sorry – it’s not ‘my’ hospital. I do not own it. Although I know it so well that I feel I should. It’s the hospital I attend. One of them has overseen a major surgery on me before when my neurosurgeon, Mr Watkins, was out of the country (again, he is not ‘my’ neurosurgeon. He is a free man. Although I have told him that if he ever emigrated, I would follow him and pitch a tent in his back garden rather than go to someone else). This neurosurgeon who stood in for Mr Watkins writes his own blog, which really inspired me to do this one. He is a lovely guy and has a ‘anything is possible’ approach which really shines through in his blog posts. So I thought he’d appreciate what I am trying to do. Mr Watkins is absolutely on my list but I think he may be more beneficial in the actual medical side of things, given his devotion to the treatment of hydrocephalus and research in the area. And as he is the busiest neurosurgeon I’ve ever come across as he travels extensively with his work, I want to have a concrete idea of what I need from him; being vague won’t really get us anywhere. So for now I am continuing with the surgeons and departments whom I feel will be able to give shunts. Then I need to start approaching those who might be able to give medical advice and maybe encourage trainees to travel out and give medical assistance to these youngsters. So, cup of tea and back to work! I shall update soon! Thank you all for your encouraging feedback by the way. Any advice or ideas are always very gratefully received and I appreciate your support. Shunt Donation Project – Ooooh, LOTS to tell!! Its great that you have found such a great neurosurgeon! Doctors really have such a power to influence and inspire our lives and it makes the connection incredible when done right. I am really happy for you. By the way, I may have just missed it, but could you give us an idea of what exactly you are asking for them to partake in? Is it like a new treatment or something? It’s basically to try and get shunts which are often discarded in the UK (unused of course) over to countries which are too poor to afford them or have very limited treatment options. There is a lot of red tape/busy doctors to get around so it will take time but I am determined. Children should have a chance, not none at all.